2-in-1 Trunk Organizer and Cooler Bag Only $15.99! Down From $57.00! You are here: Home / Great Deals / 2-in-1 Trunk Organizer and Cooler Bag Only $15.99! Down From $57.00! Check out this 2-in-1 Trunk Organizer and Cooler Bag on sale for $15.99 (Reg. $57.00)! Turn that messy car into the model of organization with this super-cool innovative Trunk Organizer and Cooler Bag. 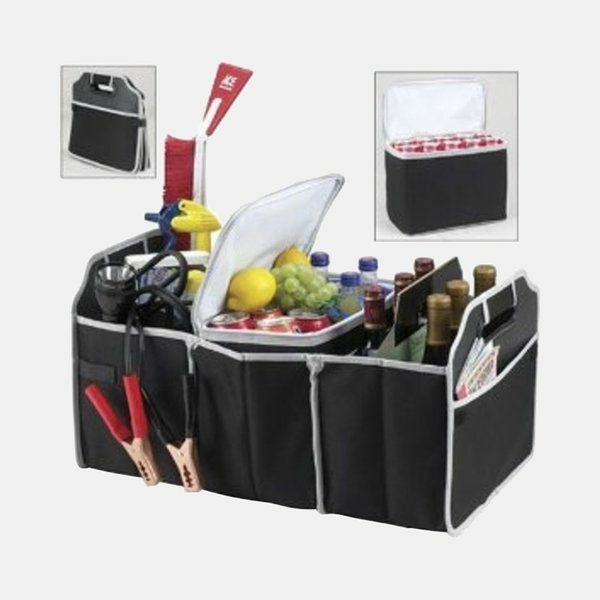 Specially designed for multiple purposes, it’s perfect for arranging groceries, emergency tools, picnic supplies, and much, much more. No more objects rolling around the back of the car when you turn corners or hit the brakes. It features 3 sections including a removable insulated cooler with a leak-proof thermal shield that will keep your food and drinks at just the right temperature. The mesh pocket is ideal for maps, brochures, pens, and other stationery. Fold this baby up when not in use. Your car will never look the same—in a good way. Keep it simple with this must-have organizer.